Support MACC’s Mission by making an online donation. As a non-profit organization, MACC depends on people such as yourself for donations. We treasure the generosity of its patrons, donors and benefactors. Please consider making a tax free donation to partner with us in our continued mission to educate and empower future leaders. Donations are tax deductible to the extent of the law under the IRS 501 (c)(3) regulations. If you have any questions or for assistance with your donation, please contact the Mission Advancement Office at (866) 893-6222 or (210) 732-2156 ext. 7126. Click here to make on online donation today! Join MACC ‘s mission to empower and educate leaders for service in a culturally diverse Church and society by becoming a lasting part of the MACC Campus. As you walk the pathways that surround the Shrine of Our Lady of Guadalupe and San Juan Diego, you can read the names of MACC supporters permanently etched in brick. These bricks memorialize and celebrate the diversity and breadth of MACC ‘s family and benefactors. Years from now, as visitors of MACC walk the grounds, they will see the incredible support of those who believed in Hispanic ministry and paved the way for MACC ‘s legacy. 4” x 8” bricks can accommodate three lines of text with a maximum of sixteen (16) characters of space per line at $100.00. 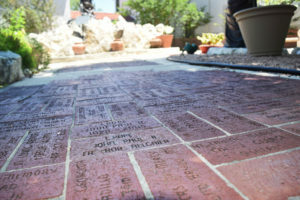 8” x 8” bricks can accommodate six lines of text with a maximum of sixteen (16) characters of space per line at $250.00. MACC awards scholarships to participants actively working in pastoral ministry and who could not otherwise afford the training and preparation of MACC’s courses and workshops in the pastoral leadership formation and / or the language study programs. MACC encourages gifts toward scholarships in order to directly support pastoral leaders in their efforts to work with the Hispanic community to build up a diverse and multicultural Church and society. Consider a gift in support of MACC ‘s general operations. As a not for profit charitable organization, MACC depends on the generosity of its patrons, donors and benefactors to partner with us in order to continue providing quality and up-to-date programs. Planning for the future. Consider planning a gift to MACC that we may be able to continue our ministries in support of our mission. All donations are tax deductible to the extent of the law under the IRS 501 (c)(3) regulations.